Xiaomi unleashed the Mi Pad 2 tablet alongside the Redmi Note 3 smartphone. In a welcoming move, Xiaomi has also added the Windows 10 OS to its catalogue. The Mi Pad 2 will be available in 16GB and 64GB internal storage variants for Android. Both of these models priced at CNY 999 (around Rs. 10,300) and CNY 1,299 (around Rs. 13,500) respectively. The variant running Windows 10 OS will be available in single storage option of 64GB, for a price of CNY 1,299 (around Rs. 13,500). The Android 5.0 Lollipop-based MIUI 7 Mi Pad 2 will go on sale in China from November while the Windows 10 powered variant will be up for sale in December. 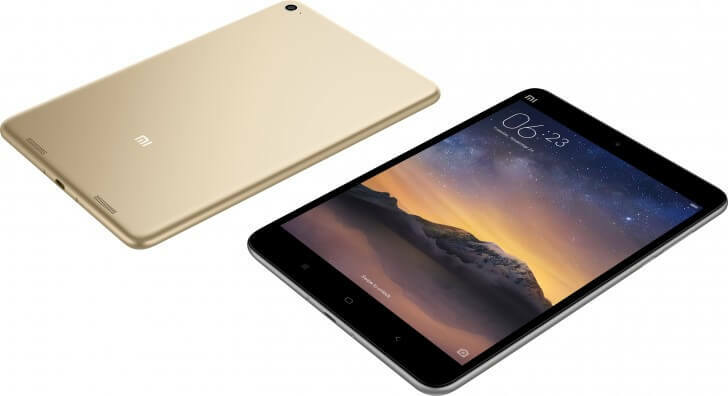 Coming on to the specifications, the Xiaomi Mi Pad 2 features a 7.9-inch IPS display with a resolution of 2048×1536 pixels. It is powered by a 64-bit quad-core Intel Atom x5-Z8500 chipset coupled with Intel HD GPU and 2GB of RAM. Interestingly, the Mi Pad 2 is Xiaomi’s first device that comes integrated with an Intel chipset. In the imaging department, the device sports an 8-megapixel primary camera with LED flash and f/2.0 aperture, along with a 5-megapixel wide-angle selfie camera. The tablet supports connectivity options such as Wi-Fi, USB Type-C, Bluetooth v4.1, and GPS connectivity. Backing the metal-clad device, is a 6,190mAh of battery, which is touted to deliver up to 648.8 hours of standby time. The Mi Pad 2 weighs 322 grams, measures 200×132.6×6.95mm, and will be available in Dark Grey and Champagne Gold colour options. It is almost 18 percent thinner than the Mi Pad. I was expecting a cellular version but Mi Pad2 is WiFi only.